You may have seen our friend Ross Piper on World’s Weirdest Events recently, on BBC2. 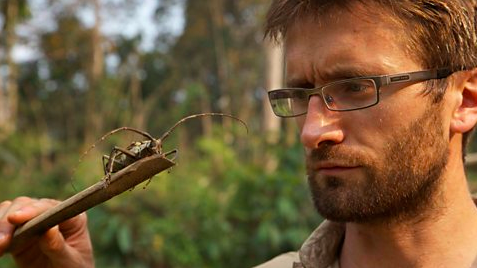 He is an expert on insects, but has a passion for the whole natural world. What started your interest in Zoology and Entomology? I remember always being fascinated by animals, particularly small things I could pick up. Even as a nipper, I was always looking under stones and logs for insects. The first time I found a violet ground beetle and an elephant hawk-moth caterpillar (I was 4 or 5 at the time) really sticks out in my memory. I didn’t really have a clue what they were, but I was absolutely mesmerised. I still have the same feeling now when I find something I haven’t seen before. What did you study at University and where did you study? I did Zoology at Bangor University and a PhD in entomology at Leeds University. I suppose I would call myself an independent zoologist/entomologist and science communicator as it’s important to get the public interested in the natural world. I am working on some more book ideas (animal diversity), investigating ways of improving insect production for livestock, pet and human consumption, devising new techniques for sampling terrestrial arthropods and planning further expeditions. I also do habitat and species surveys. We saw you in Burma for the BBC in Wild Buma. Have you visited China or any other South East Asian countries? I have been to Sabah and peninsular Malaysia. I love this part of the world, but the habitats here, as diverse as they are, are perhaps the most threatened on the planet. Do you have a favourite insect? If so why would you choose it? Over one million insects species have been described, so there’s a lot to choose from. The tarantula hawks (Pepsis sp.) would have to be right up there. I caught one in Brazil that was as big as a small bird. These insects hunt and grapple with tarantulas. They administer a paralysing sting to the spider and then drag it off to a safe place before laying en egg on it. The wasp larva consumes the paralysed spider. How badly, in your opinion is the human factor influencing ecosystems around the world? Humans are having a devastating impact on life on earth. In the last forty years alone the populations of many species have declined enormously. Even things as seemingly benign as eating meat have far reaching consequences on the biosphere. All of the problems boil down to our profligate use of the planet’s resources and the ever-increasing obsession with economic growth that underpins capitalism. We’ve all been seduced by wanting more and more of everything and it is this which is eroding all of the systems that make the Earth suitable for complex life. The Earth is a completely self-contained system, so continued economic growth is a dangerous fallacy. For the sake of generations to come we have to wake up. Is there anywhere you would like to visit in particular in the future? Loads of places, but Papua New Guinea, the eastern reaches of the Himalayas and the forests of Central Africa are of particular interest. If you had one message regarding your field that you would like to pass on, what would it be? The natural world is still full of mystery. There’s still so much out there to discover. We know way more about cold, dead rocks in space than we do about our own beautiful, living planet. Are there any animals, insect or otherwise, that creep you out for any reason? I’m not too keen on slugs, but I appreciate them from a zoological point of view. The mating behaviour of the leopard slug is one reason to appreciate them. Do you have any new books or other projects on the horizon? I have a couple more books in the works (very early stages) and have recently been on World’s Weirdest Events (BBC 2 – Episodes 5, 6 and 7) talking about various insects and spiders. Ross has already published several books, available to buy now! Click here for more info.